Develop an essential understanding of the principles of equine disease with this one-of-a-kind, problem-based resource! 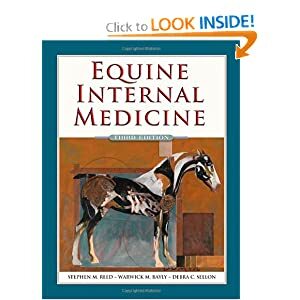 Extensively revised and updated with contributions from an international team of experts, Equine Internal Medicine, 3rd Edition reflects the latest clinical research in equine medicine and focuses on the basic pathophysiologic mechanisms that underlie the development of various equine diseases to help you confidently diagnose, treat, and manage patient conditions. Problem-based approach outlines how to apply the latest clinical evidence directly to the conditions you'll encounter in practice. Pathophysiology is emphasized throughout, providing a sound basis for discussions of the diagnosis, treatment, and prognosis that follow. Body systems chapters begin with a thorough discussion of the diagnostic method appropriate to the system, including physical examination, clinical pathology, radiography, endoscopy, and ultrasonography. Flow charts, diagrams, and algorithms clarify complex material. Extensive content updates help you improve patient care with up-to-date research and clinical evidence across the full spectrum of equine practice, including: New sections on biofilm ahesins, resistance to phagocytosis, and host substrate utilization New information on changes in body weight Recent findings on fibrocoxib and diclofenac Expanded and reorganized coverage of critical care New material on inborn errors of metabolism and acquired myopathies Detailed treatment information on various disorders of the reproductive tract A new section on toxicoses causing signs related to liver disease or dysfunction Bound-in companion DVD includes more than 120 high-quality video clips that guide you through procedures related to the cardiovascular and neurologic systems.